Today, the much anticipated Qatar Airways First Class Lounge Al Safwa opened at Doha Hamad International Airport. A friend of mine was traveling Qatar Airways First Class and had the opportunity to enjoy this amazing lounge on its opening day. Below are some pictures he made with his smartphone which give you a general idea of the lounge. For more details, check this Flyertalk thread. 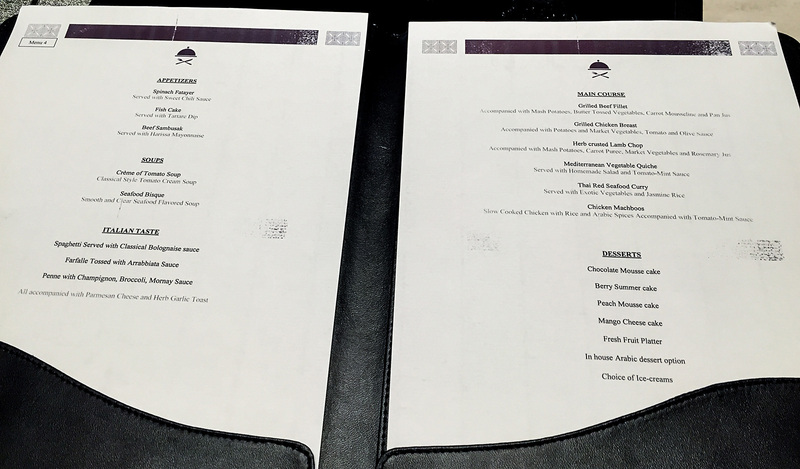 Here’s the lunch menu of the opening day. Hi Andrew, most reports indicate the QR First Class lounge in only accessible when you fly on Qatar First Class metal. Hi Bart. The OW website suggests that all OW member airline passengers travelling in F are entitled access? Hoping so, am flying BA DOH to LHR in a few weeks and would like to try this lounge out. Location details: Main Terminal, 3rd floor. Notes: Qatar Airways Al Safwa Lounge opened on 22nd October 2015. This lounge is only available to customers traveling in First Class on Qatar Airways or other oneworld member flights. Guests are not permitted. Al Safwa is for First Class QR and Oneworld passengers ONLY. OW status has no relevance. First Class passengers are defined as departing in F. However there is a OW exception in that arriving in Long haul F and departing on short haul J or Y also gives access. Thanks for the clarification Russell! Thanks for your input Andrew! At least there’s still Krug at the Qatar Al Mourjan Business Class lounge! Are you definite on the Krug in the Qatar Business Lounge? As I thought this would end with the opening of the First Class lounge. Hi John, we’ll need to keep a close eye on what people are reporting in the Qatar Flyertalk thread. Awesome! Thank you for the update Russell, enjoy the Krug! On returning flight now DOH – LHR. Ticketed in F on BA. Denied access to Al Safwa Lounge, told this is for QR F pax only. Website not yet updated to reflect. Disappointed. Lounge options are Qatar Airways First Class Lounge or Oryx lounge. I was fortunate enough to visit the Qatar Air first class lounge in December. I have to say I was sad that my connection was so short, I was hoping that my connection would be cancelled!! Unreal! As lifelong AAdvantage member, I have been conditioned to believe what a “first class” lounge experience would be. This place blew any expectations I had away. So much so, that the next time I travel to the middle east I will route through Doha just to experience that level of service and comfort. Kudos to Qatar Airways!! Well Done! Thank you for sharing your experience Steve! Indeed, Al Safwa is one amazing place! QR diamond travelling in C .. Can use new First lounge in Doha? Unfortunately not, only if you’re traveling QR F.